SINGLE TRACK SIGN HOLDER -- 48"
Signs slip into a slot cut in the PVC plastic channel and are gripped securely even under windy conditions. Track comes with double sided tape on the back that attaches to most metal, wood or plastic surfaces. Or securely attach with nails or screws. Track comes in 4' lengths that cut easily into shorter pieces for a variety of users. 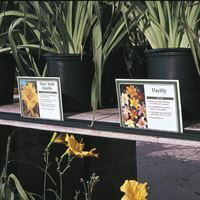 Perfect for metal display racks and bedding plant areas. 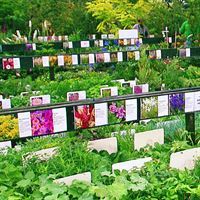 European Garden Centers have recognized the benefits of using track signing systems for years. Great for saving time and labor and reducing sign clutter. These systems are made to withstand the grueling effects of sun and outdoor elements. The track is easily trimmed to fit specific lengths. Mount the track with nails or small screws for best results. Made of weather resistant PVC plastic. Holds standard 7" x 5" signs.